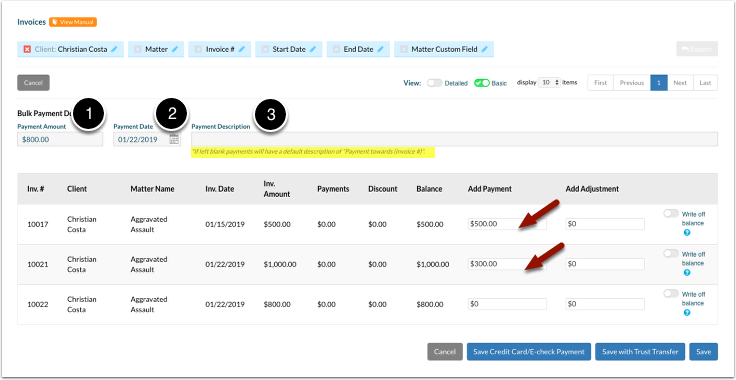 Rocket Matter Knowledge Base Invoices: Bulk Payments and Adjustments -NEW!How to transfer trust funds in bulk for invoices. 1. Click on 'Invoices' in your left-hand navigation panel. 2. Select your filter(s) from the 6 blue icons on the top of the screen. Enter your search criteria and select 'Apply'. Note: You can take a deeper look and filter between 'Unpaid', 'Paid' or 'All' invoices for your client. The invoices will populate below, in order from oldest to newest. 3. Click on the blue 'Pay Invoices' button. 4. Enter the total payment in the 'Payment Amount', select the 'Payment Date' and enter 'Payment Description'. If the payment is more than the oldest invoice amount, the remaining funds will be applied to the next oldest invoice. If you'd like to modify the amount, simply click on the amount and enter the dollar amount you desire. If any additional funds from the total payment are not applied to a specific invoice, you will be prompted when saving your changes to allocate the overpayment to your clients trust or operating account. If the payment description is left blank, payments will have a default description of "Payment towards (invoice #)". Note: If the dollar amount of your payment exceeds the amount of the oldest invoice then the remainder of the payment will be applied towards the next oldest invoice. 5. Once your payments have been allocated to your invoices correctly, select 'Save with Trust Transfer' on bottom right of the screen to record the payment. 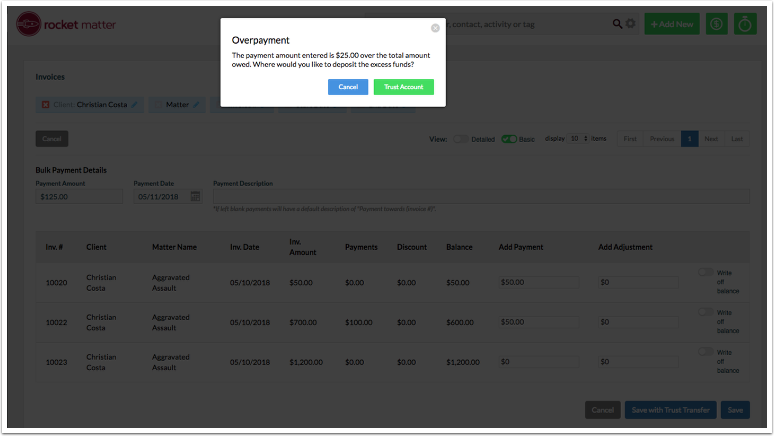 Prev: How to apply payments to invoices in bulk. Next: How to apply payments to invoices in bulk with a credit card.